Plant this fabulous fall, winter, and spring container! 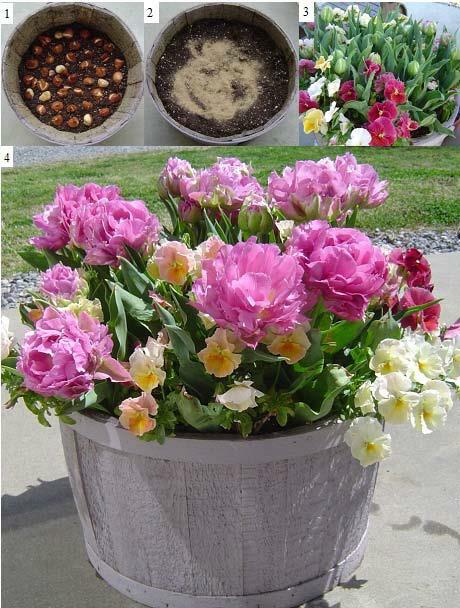 Follow these simple steps and you will have a low maintenance, easy keeper container that is beautiful until spring! Fill the container with 3” of potting soil, firm in. Place your tulips bulbs firmly in the soil, and place them as close together as eggs in a carton. Top with soil to make container 2/3 full. Mix in dry fertilizer following directions. Place the plants in the container with their neckline to fall about 1” below the rim of the planter. Continue filling the container with potting soil, firming to remove any air pockets. The finished containers soil line should fall 1” below the container rim. Place in a sunny spot and water well. Your plants will put on a show all fall and winter. Come spring the tulips will pop through for the grand finally. A large frost-resistant container at least 12″ deep and 20″ wide. The larger the better. A wooden half whiskey barrel works great. 30 tulip bulbs of your choice. Enough pansies to fill the container nicely. Squirrels digging you your plants and bulbs? mulch. These prickly balls annoy the squirrels as much as they do us! Place gumballs on the finished container soil surface or garden bed 2 to 3 gumballs deep as a deterrent for thesquirrels! Click here for a printable version of One Container—Three Seasons! So, you want to be a flower farmer?